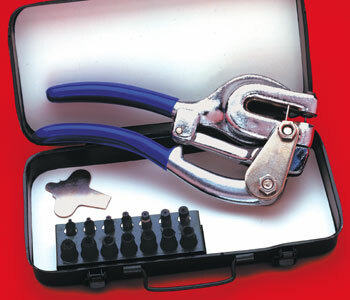 This hand punch has a capacity of 1/4" through 16 gauge mill steel. Depth of throat is 1 3/4". Overall length 8 1/4". This is just the right tool for punching springs. Includes punches and dies for 3/32", 1/8", 5/32", 7/32", 1/4", 9/32", and 3/16" for springs and 1/16" for contact point holes.